Place the sugar into a thick saucepan and stir in low heat until the sugar syrup melted and golden brown in color. Remove immediately from heat and pour the syrup into 9 inch round baking pan and let it harden. Mix filled sweetened condensed milk and filled evaporated milk with eggs and water, add vanilla extract (optional) until thoroughly mixed. Pour the mixture into the baking pan. Set the baking pan in a larger rectangular pan. Place both of these into the oven (350 °F). Pour hot water into the larger pan to within ½ inch of the top of the baking pan. Bake uncovered for approximately 50 minutes, or until a toothpick comes out clean when inserted into the center of the flan. Remove from the oven and the water bath, let cool. Refrigerate. When ready to serve, run a knife around the edge of the flan and invert the flan onto a serving platter or plate. The caramel sauce will cover the flan. 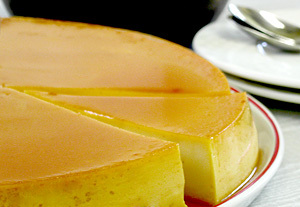 The flan can be prepared a day before seving. It will absorb the flavor of the caramel sauce.